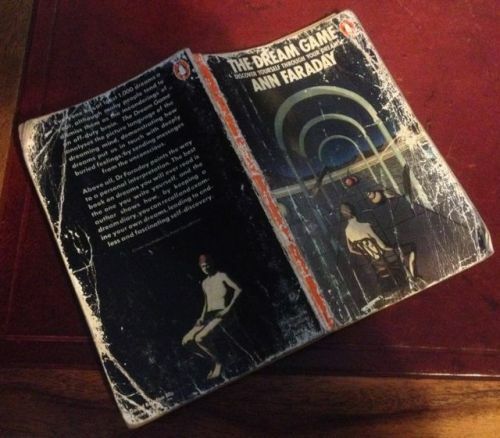 While making the rounds of various TV and radio talk shows, with the release of Dream Power (1972) and subsequent release of The Dream Game (1975), psychologist Ann Faraday popularized both the activity of dream journaling and the idea dreams could be meaningful. Keeping a dream journal or dream diary is a necessary part of dream interpretation, according to Faraday. Without a written record made upon waking, dreams are usually forgotten. Writing the dream down is a necessary step toward preserving the details necessary for meaningful interpretation. She emphasized dreams could not always be interpreted literally but that a literal interpretation should always be considered, first, for signs of objective truth. One should not impose meanings on dreams, rather, they should allow the dream to “speak for itself” (Faraday, 1972, p. 158). If a dream is telling you what you already know, then you should move on towards looking for signs of metaphorical interpretation. In an undated interview from the 1970s on The Amazing Kreskin’s TV show, Faraday noted how an individual’s environment could shape their dreams. At the time of the interview, she was living in Florida. She had a dream of alligators that she wrote in her dream journal. As she had young children, she interpreted this as her subconscious’s way of telling her she had to be careful of alligators harming her children. Had she been living in New York, a dream about alligators would have meant something else entirely different. Perhaps someone she knew had alligator-like qualities. Perhaps her subconscious was intonating she was behaving like an alligator. If she didn’t know of anyone who had been acting like that, she should consider that her subconscious was indicating her. After completing her thesis on experimental dream interpretation in London, Faraday studied both Freudian and Jungian analysis and Gestalt therapy. Faraday’s work stood apart from Freud. Freud believed much of the motivations for one’s thinking was shaped by childhood traumas and experiences. To uncover these formative experiences and get to the root of neuroses took work by the individual and a trained psychotherapist, according to Freud. Her work with dreams and dream interpretation stood this kind of thinking on its end. She advocated this form of do-it-yourself psychotherapy. “It is now widely accepted that symbols in dreams reveal rather than conceal the truth from the dreamer, presenting it, moreover, in a very precise, condensed form,” Faraday wrote in her 1975 book (p. 54). Faraday said dreams typically covered what the mind had been thinking of over the past couple of days. In order to understand them, we need to understand what we were preoccupied with over the past few days. “Whatever paranormal powers the dreaming mind may possess, they are quite unimportant from the practical point of view in comparison with the ‘normal’ function of our dreams, which is to give insights for daily life. Dreams certainly CAN give us important practical warnings but these can almost always be traced back to the heart’s subconscious detective work.” (Faraday, 1975, p. 311). Rule 1: Have your recording equipment handy. If you have to look for your paper, dream journal or tape recorder, you’re going to forget your dream. Rule 2: Date your paper or recording tape in advance. It acts as a token to your mind that you’re awaiting its messages. Even better is to write “Dream 1” as if you’re going to have more than one dream to record. Rule 3: Encourage your dreams by means of a suggestion or prayer. Rule 4: Never trust your unaided memory and beware of procrastination. If you don’t write a dream down, you’ll lose sleep trying to hang onto the information during the night. Rule 5: Never dismiss a dream as too trivial to recall. On the other hand, don’t strain to recall a dream because if it’s important the dreaming mind will bring it up again later. Rule 6: Record your dream as fully as possible. Try writing in the present tense because that will help keep the dream alive for you. Note your mood upon waking. Note any colors that stand out in the dream. Rule 7: (for real enthusiasts) When you’ve recorded your first dream, don’t go back to sleep until you’ve invited the next one to come to you. Do this by writing “Dream 2:” after your first entry. Rule 8: Transcribe your dreams the following day. Allow a separate sheet of paper or a card for each dream. This paper or card should be clearly dated. File these paper in a notebook or filing box. Rule 9: Relate the dream to an event of the day. This will give a vital clue as to the meaning of the dream. Also, you don’t get the best out of the dream game if your sleep is disturbed by indigestion or intoxication. The most important of these two rules are (1.) Write the dream down upon waking and (2.) Relate it to an event of the previous day. Violating the first rule results in a loss of dreams. Violating the second rule renders interpretation impossible.